I learned to ride about six years ago. I started taking lessons on a Tennessee Walking Horse. I was 34 years old and clueless about horses. After about a year, I bought a show horse that was up for sale. I had been taking lessons on her for about three months, and I was hooked. She was a top five ribbon mare in the show ring competing in rail classes. She had Lite Shod shoes on, but they were heavy and overhung beyond her heel bulbs. I had problems with her over-striding and stepping on the fronts; this resulted in pulling them off or bending them. Eventually, I went to Keg Shoes. They were lighter, cheaper to replace, and I didn’t have problems with them being stepped on while she was out in the field. 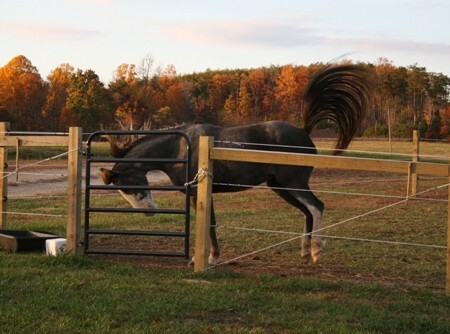 I had begun to become concerned because, her hoof wall was starting to look rough and chipped with all the nail holes. I began to suspect that they were coming off more often now because of the weakened walls from repeated nailing. At this time, I didn’t know anyone who went barefoot. I was new to the horse world, and my friends and family were walking horse people. I was taught that horses had to have shoes for show success or for riding them any length of time outside their soft pasture. 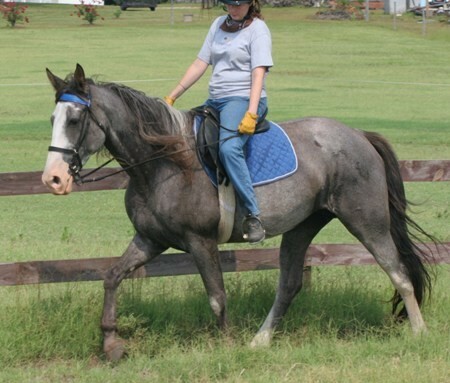 After owning this horse for about a year and a half, I decided that I really enjoyed trail riding and so did my mare. I discovered competitive trail riding and NATRC (North American Trail Ride Conference) through a Google search. I was very intrigued and started learning all I could. The first ride I attended was at Uwharrie National Forest in North Carolina. I came as a volunteer to see what it was like and determine whether it was something I thought I could do by myself. I didn’t know anyone who did it and couldn’t get anyone interested. It rained hard and was cold on the Saturday leg of the ride, which consisted of the first 25 miles. I was a scribe for the veterinarian judge. 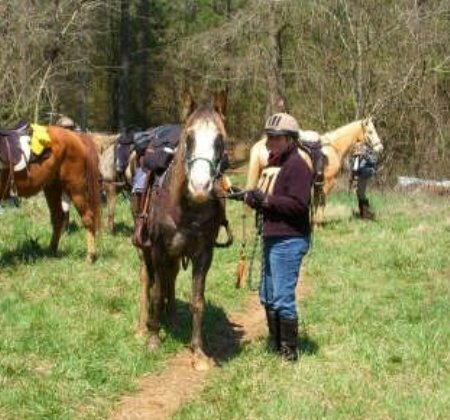 We would camp out in the woods and on rocky outcroppings to view the horse/rider teams attempting certain obstacles or terrain challenges. The vet would tell me the scores to write down for the horse/rider teams as she evaluated them. One of the terrain challenges was a hill that was one big rock surface. It was pouring rain and near freezing, and I noted that many horses were skating over the rock while climping the ascent. Some horses, however were scrambling up like mountain goats. I asked the vet why some horses were having a hard time and others were not. That’s when I first heard about the possibility of horses going barefoot and/or riding in boots. I was amazed. She directed me to a rider that I could talk to later in the evening who used Easyboots. That was where it all started for me. I went home and did tons of research online, inluding on the EasyCare site. 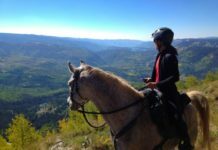 I joined a chat group for competitive and endurance riders and asked tons of questions. Then I had the shoes pulled. I bought books and read about barefoot trimming. Then I found a barefoot trimmer online and had him come out. I had several friends and family memebers tell me that I would be messing up my talented walking horse and that she wouldn’t “walk” the same or win anymore. I didn’t care. I wanted a sound, natural horse, and I couldn’t believe this horse who was bred to walk this way couldn’t do it without shoes. I had seen colts do it in the field. Shortly after, my husband and I moved to another state with his job. I had to find a new trimmer. Fortunately, I found an awesome trimmer who also sold EasyCare products. 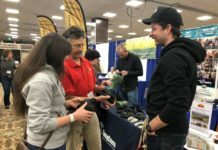 I bought my first pair of Easyboot Gloves from him. I really wanted to start training for distance riding. We had moved from very sandy soil and flat terrain, to hard rocky soil in a mountainous terrain. My mare had only been barefoot a few months, so I needed the boots to help her transition to barefoot in this new terrain. I got four boots. I mostly used just the fronts for trail and training rides. Occasionally, the terrain called for rear boots too. She remained barefoot in the field, and I would walk her up and down the driveway with pea gravel at the beginning of my training sessions barefoot, then put on the boots for the ride. Within a year, I had a wonderfully healthy, barefoot TWH, that could trail ride barefoot or with front boots in most places. I always packed all four boots in my Stowaway Packs, in case I needed them, or in case one of my shod riding buddies lost a shoe. 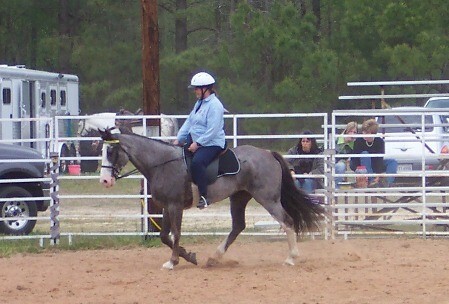 My next step was to compete in a competitive trail ride. I went back to Uwharrie National Forest where I had previously volunteered. I began by competing in a one day ride. The terrain there is pretty rough, and shoes all around are recommended by the ride staff. At this time, NATRC did not allow anything above the coronary band for competition; so no gaiters. I had heard about some people gluing, but it was fairly new. I had no idea how to do it, and have the glued on shells stay put. After some research and consulting with my trimmer/ EasyCare dealer, I decided to put Sole Guard on all four hooves. We applied this on two nights before my competition. I had to leave the following morning to arrive at the competition for check in and vetting. I vetted my horse in on Friday afternoon wearing Sole Guard. My vet judge had to ask what it was. The following morning, I went on my first CTR for a one day ride consisting of 20 miles. When I made it back to camp, we had Sole Guard still in both front feet, but none left in the rear. I remind you that this is some tough terrain, and I too had to scurry up that hill that was one big sheet of rock. No slipping occured, and she amazed me how easily she took that hill. 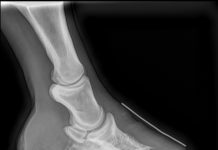 Upon my vet check after the ride, I had no downgraded scores for lameness or any marks on her heel bulbs or coronary band. I was thrilled when we one Second Place in Horsemanship in our Novice Division, as well as First Place in Horse Condition. First NATRC ride in March 2008 using Sole Guard. Since then, my mare and I competed in a fun show while barefoot. We still ribbonned. I have learned a lot more about horses and my riding abilities have improved over the years. I changed horses about 18 months ago. He too, was a shod TWH. My husband and I had had just moved back to our home state. I was on the hunt again for a skilled trimmer. Luckily, after some research and phone interviews, I found Rebecca Wyatt, PBHT II of Nature’s Path Hoof Care. She also is an EasyCare dealer and is very knowledgable. With her guidance and skills, I have converted my 12 year old gelding to barefoot. My previous mare’s boots didn’t fit him. I decided to try the Easyboot Edges first, but ended up going back to the trusty Easyboot Gloves. I’ll save the experiences of my current mount and me for another blog. Until next time, thanks to EasyCare and all the innovators in hoof trimming. Don’t let anyone tell you that it can’t be done.